May yesterday go down in history as the day that I spent twenty-five dollars on Brussels sprouts. I didn’t mean to do it! I knew I needed plenty of sprouts in case I encountered another recipe failure. The sprouts were packed in big bags, so I grabbed two and continued on to the green onions. That’s how they get you—with those big, pre-packed bags. Then, I was a terrible customer and read email during check-out and didn’t even notice until I glanced at the receipt at home. Twenty-five hard-earned dollars! Who am I? The sprouts weren’t even good sprouts. I’ve been robbed. My only consolation is that my sprouts turned out great on my next try, so I have extra sprouts for later. This Kung Pao Brussels sprouts dish is my take on a popular Chinese stir-fry recipe, Kung Pao chicken. I roasted up lots of sprouts and tossed them in a completely irresistible, spicy soy-honey glaze with green onions and peanuts. It’s a killer vegetarian appetizer or side dish, and I wouldn’t judge if you wanted to eat it for dinner on its own. This recipe has actually been ten months in the making. I became completely enamored with the concept when I found it in the pages of Bon Appetit’s February issue, but when I cooked their version in our Austin kitchen, I was disappointed. It was crazy salty and just generally not awesome (sorry, Bon Appetit!). I gave it a couple more shots and eventually gave up. Fast forward to December and I’m craving more roasted Brussels sprouts. I remembered the Kung Pao sprouts and wondered if I couldn’t come up with a similar, less salty and way more tasty version, based on my roasted Brussels sprouts with crispy baked tofu dish. It’s one of my favorite recipes, so I played around with it and here we are. My version is, admittedly, pretty far from traditional Kung Pao chicken. I roasted the sprouts instead of stir frying them (too many sprouts for one pan) and omitted the Sichuan peppercorns (where do you find those?). It is awesome, though! 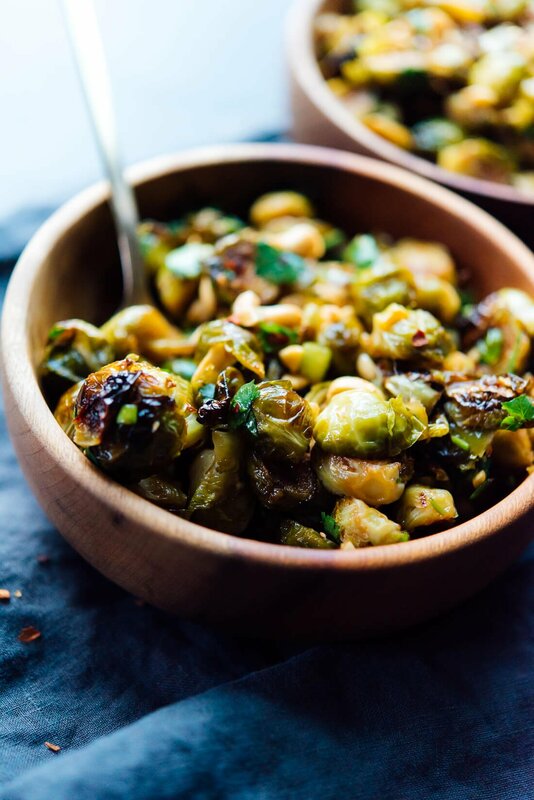 Roasted Brussels sprouts tossed with spicy Kung Pao sauce! This is a delicious vegetarian appetizer or side dish inspired by a popular Chinese dish. Recipe yields 4 side servings. Meanwhile, to prepare the sauce: In your smallest saucepan, add the tamari or soy sauce, honey or maple syrup, rice vinegar, sesame oil, ½ teaspoon sriracha and garlic. Whisk until combined, then taste and add more sriracha if you’d like (mine was just right with 1 ½ teaspoons sriracha, but I love spicy food). Bring the mixture to a boil over medium-high heat, stirring occasionally. Reduce heat to medium and cook, stirring often, until the sauce has thickened, about 5 minutes. It’s done when, if you take it off heat long enough for it to stop bubbling and carefully tilt the pan back and forth, the sauce will slide down the pan rather than slosh. 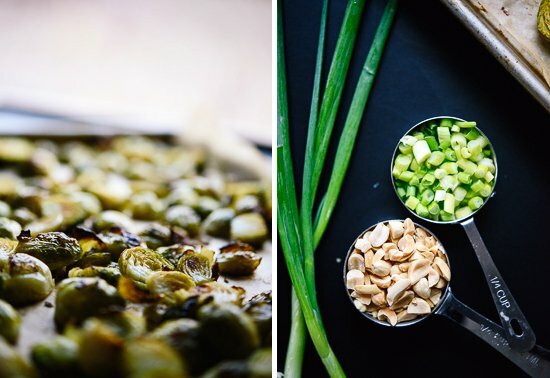 Transfer the roasted sprouts to a medium serving bowl. Pour the sauce over the sprouts and toss to coat. Add the peanuts, green onion and optional cilantro and toss again. Serve immediately, with red pepper flakes sprinkled on top if you’d like a little extra heat (and color). 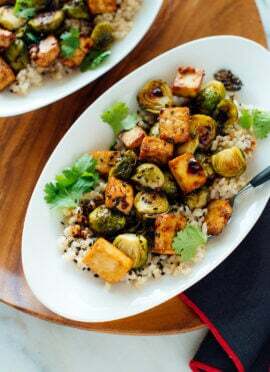 Recipe inspired by Bon Appetit and adapted from my roasted Brussels sprouts and crispy baked tofu with honey-sesame glaze. *Make it gluten free: This dish is gluten free as long as you use gluten-free tamari, which is a variety of soy sauce that is usually (but not always, check the label) gluten free. I always use tamari instead of soy sauce because I prefer the flavor of it! Look for tamari next to the soy sauce in the Asian aisle of the grocery store. Make it vegan: Simply swap maple syrup for the honey instead when making the sesame glaze. Make it peanut-free: Just omit the peanuts. You might like a sprinkle of sesame seeds instead. Change it up: Broccoli would be a fantastic substitute for the sprouts, and probably cheaper, too! Holy expensive!! Thank goodness the recipe was worth it though – these look fantastic. I really love that sauce! Thank you for sharing, Val! Those sweet potatoes look amazing. I scoured my local grocery stores awhile back looking for Szechuan peppercorns, and I finally found them at Whole Foods. They were in a tiny box, though, and were quite pricey. I didn’t end up getting them, and I’m sure these sprouts are just fine without the addition of the Szechuan. Yum! 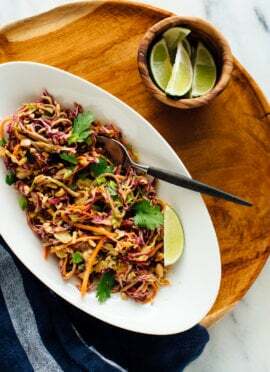 I love sprouts in any form and I’m sitting here trying to figure out a time I can make these when my family (who generally aren’t big spicy fans) doesn’t have to eat them. Yum, Chinese Brussel sprouts minus the MSG. It was worth the $25! Brussels sprouts are one of my favorite veggies! You can find Sichuan peppercorns in Asian grocery stores or online like Amazon. It’s pretty spicy though (more like a numbing kind of spicy). Now I’m kind of scared to try them. Just added some to my Amazon wish list! Sichuan peppercorns are easily found online. Won’t mention any specific sellers to avoid looking like biased. That’s good to know! Thanks, Deb. I’ve had some misfires recently with Bon Appetite’s recipes. I’ll have to try your version- it looks brilliant. YUM. My co-op has kung pao brussels sprouts in their deli, and they are one of my favorite sides. I’ve been wondering how to make them at home – these will need to happen this weekend! I have also waaaay overspent on brussels sprouts in the past. Expensive little delicious nuggets, aren’t they? Oh fun! I wonder how these compare to your co-ops. Happy holidays, Katie! I am always looking for a new way to dress up my favorite veggie! 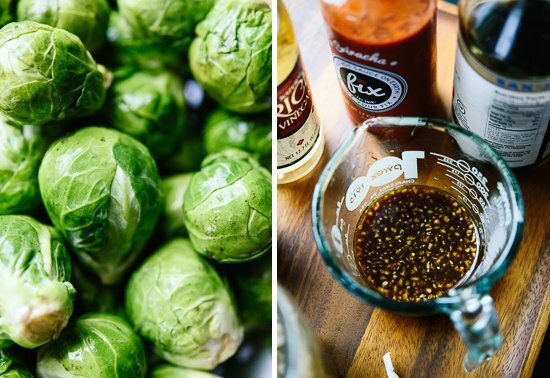 oh my gosh, i can just imagine how delicious brussels sprouts are with that sauce! and i too have been victim of not paying attention at the grocery store and winding up with a huuuuge bill. happy holidays, xo! Ugh, it happens! Happy holidays, Lindsey! Kung Pao Brussels Sprouts! It even rhymes, too. That’s genius, Kate! I would have never imagined the combination, but I LIKE IT! I love the flavor and veggie pick. I will cook this….finals are finally behind me, and I feel the need to cook now….you cannot even imagine! i dont know where to find those peppers either, in nepali its called timur and i always ask my mom to send me some. i love the peppery taste but i dont use it that often. These look delicious! I’ve never head Kung Pao chicken (I’ve never encountered here in my corner of Europe) but I love those flavour combinations and your tofu and Brussels sprouts dish is indeed amazing. I have Szechuan peppercorns in my cupboard and I fiery dislike the taste. It is indeed spicy in a numbing sort of way, also a cold sensation, like you ate a tube of very minty, frozen toothpaste, or like you’ve been at the dentists and your entire mouth is still anesthetized. The bf however loves it and sprinkles it over every Asian dinner. If you ever get your hands on it, I’m very curious to learn if you’ll get as addicted as he is, seeing as you like your food spicy right? Hi Evelyn! Well, now I’m wondering if I’ve ever tasted Szechuan peppercorns. That sounds like quite an experience. I love spicy food, but not so spicy that my mouth goes numb and I can’t taste anything else! I’ll try to buy some and find out soon. Kate, this recipe looks fantastic! 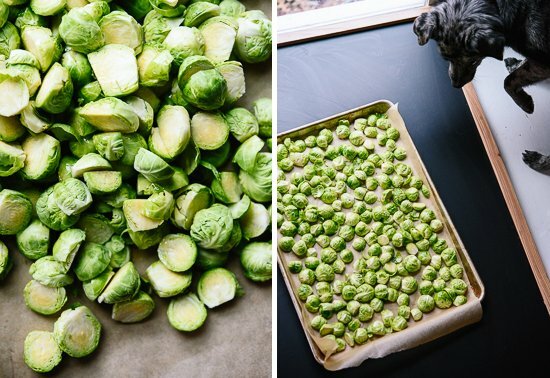 Love love love my Brussels and can`t wait to make these! I`m a definite carnivore but reading your recipes makes me think again! Beautiful site!! Those bowls!! Be still, my heart. Roasted Brussels sprouts are THE way to go. Love this twist on them! I feel you on the $25 brussel sprouts. I once bought a head of cabbage and didn’t notice until I got home that I paid $8 for it. Cabbage. Peasant food. I used every ounce of that caviar-dream ingredient. The brussels look amazing, going to have to give it a go! Eight dollars for cabbage! That’s a lot. Glad you made good use of it. I just made this!!!! Delicious!! I didn’t have Siracha, so subbed chili paste – which made it extra spicy! I made extra sauce and we had it over jasmine rice. My family declared the Kung Pao Brussels Sprouts a big hit! I used sesame in place of olive oil and don’t mix the two, did ground pepper rather than sriracha for the kung pao , did no honey/maple/syrup/peanuts and did tamari which I always use so I sort of kept it close. LOVE brussels sprouts!! Keep cilantro around all the time along with green onions. Thanks, Judith! Your version sounds great. Oh I absolutely LOVE this idea!! My kitchen has been so devoid of brussels sprouts lately because I’ve run out of ways to transform them – never would I have thought to make them Asian style! $25!?!?! Wowza! Well, at least you got a beautiful recipe out of them. But, damn! 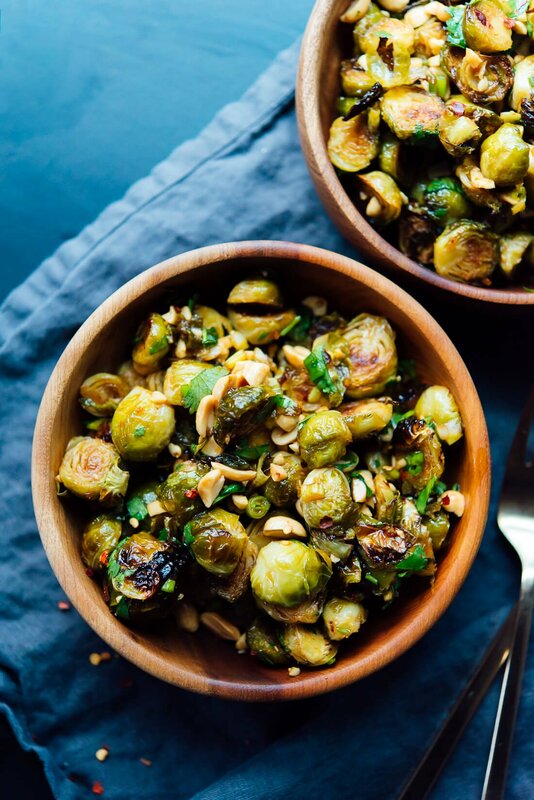 I’m always looking for ways to spruce up my Brussels sprouts, so I’m all over this. Oh man, that always happens to me at Whole Foods. One time, the pistachio bin poured way more pistachios in my bag than I’d intended to get, and I walked out with over $20 in pistachios. ‘spensive! Where do people shop at that this recipe costs that much? Wow. I’ve never seen brussel sprouts anywhere near that price anywhere that I have lived. Roasting brussel sprouts is the only way I can eat them and then I can’t stop. I’m sure cauliflower and broccoli would be just as delicious using this recipe as well. Perhaps others can find those two veggies at a cheaper price. They were $4 a pound at Hy-Vee, the grocery store nearest me. Great suggestion on subbing broccoli and cauliflower! Hooray! That’s so great to hear. Thanks, Alexa! This looks great! I think I’m going to make this for a work holiday potluck coming up. But do you think it would taste okay pre-made and cold? Only way to heat it would be microwave- not sure that would be so great. Honestly, I enjoyed leftovers straight from the fridge! If you can let them warm to room temperature before serving, I think that would be even better. Perfect!!! Hope these sprouts are a hit at your home, Margot. So glad you’re loving that tofu! I like it, you had me sold with Kung Pao. I cooked the brussels sprouts in the microwave for 5 minutes and then roasted for about 10 minutes. Heated the sauce in the microwave for 1.5 minutes and then poured it over the brussels sprouts and roasted another 10 minutes and it was very tasty. Thanks for the idea! Always looking for new and tasty brussesl sprout recipes. Can’t wait to pick up more brussels at the farmers market this weekend. (I won’t mention the price). This is a great recipe. Hope you get a better deal than I did! Enjoy! It’s a racket, for sure. I’m glad you can buy sprouts for a reasonable price! Best sprouts we’ve ever eaten. 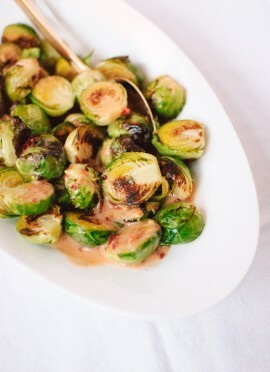 We love brussels sprouts here and these look delicious! I’ll have to add less hot sauce though because my kids do not like the spicy. I may have to make a batch just for me so I can have them spicy. My whole family loves anything Kung-Pao, and I’ve been searching half-heartedly for a recipe for kung-pao sauce on the internet but couldn’t find anything that really resembled what we get at a restaurant. So I resorted to buying a jar from an asian manufacturer, and even that wasn’t really that good. As soon as your recipe was brewing in my sauce pot, I knew I hit the jackpot! It was perfect. I roasted the brussel sprouts with some carrots, broccoli and red onion (and I’ve never tried roasting those veggies until I saw your suggestions for that) and threw in some tofu too. BIg hit!!!! I will double the sauce recipe next time because I like extra to drizzle over the rice I serve with it. Thanks again Kate! Thank you, Beth! Your version sounds soo good! Wow. I made these last night and LOVED them. I had no idea Brussels sprouts could be so good. I have avoided them for years, but I’m putting them on the menu. In fact, I think mixed with a little rice or ramen I might have my new weekly lunch for the winter. Kate! This is so delicious! Thank you. When we were making it my nine year old said, ‘It’s like a restaurant in here!’ And then my husband commented on how good it smelled, like insanely good. We’re crazy about this dish. I just made these, and they were DELICIOUS. My husband said they are the best brussels sprouts he’s ever had. Thank you! Yes! Glad to hear it. Thank you, Samantha! I made this for dinner tonight using broccoli since that’s what I had! I used apple cider vinegar instead of rice vinegar and cayenne pepper instead of sriracha (didn’t have any). It was so good with brown rice! I can’t wait to make this again using Brussels sprouts. Thank you for another easy and delicious recipe! Thank you, Alice! Your broccoli version sounds awesome. Unfortunatly in Brazil brussels sprouts are very very rare and expenssive. I suggest putting a field for easy replacement. Made this recipe for a side for Christmas Eve dinner – it was a hit. So delicious. Thank you Cookie and Kate! First time posting on your blog. New Years resolution is to make at least one new vegetarian recipe a week and your blog seems to be my go to…can’t thank you enough for the delicious recipes! Thank you for letting me know, Julie! I’m so glad the sprouts were a hit at your table. Delighted to hear that you’ve been enjoying my other recipes, too! My husband and I LOVED this – totally delicious, nom nom nom! Thanks for sharing the recipe!! Glad you enjoyed the sprouts, too! These were hands down amazing! I wish I had taken a photo as they were beautiful as well. I didn’t have peanuts so I roasted a few raw cashews and chopped them on top…awesome! My husband and I ate the entire batch for dinner!!! This sauce is so wonderful that I think I may expand it next time. I’m thinking about making a bit more sauce and cooking some mushrooms, peppers and onions. Put this on top of some rice for a veggie based Chinese style meal…yum!!! Made these for dinner last night. SUPER DELICIOUS and easy. Thank you! Made this for dinner today. So. Good. Even my kids (1.5 and 4 years old) ate it. We also LOVE your oatmeal waffles! This was hands down the best brussels sprouts dish I’ve ever had! Thank you for making your recipes so easy to follow and reliable. As a debt-laden new grad, I also appreciate the fact that your recipes are usually low cost, if we have the right things in our pantry.This will definitely become my new signature dish at all of our “fancy” dinners. Awesome! Forgot the garlic the first time I made them and they were still delicious. I doubled the recipe the second time and roasted some broccoli along with the brussel sprouts. Out of this world good and healthy too. Omg! Kate, you don’t disappoint. Every recipe I try from your blog has been fantastic. This one takes it over the top. Superb! Many blessings to you! I’ve recently gone veggie and love making asian food. This did not disappoint!!! I doubled the glaze to make it extra saucy and had with mushroom egg fried rice! So good. Excited to try more recipes of yours! We had “apps for dinner” last night with family and hands down these were the winner of the evening! Thank you! I don’t see Szechwan peppercorns in your recipe? I see red pepper flakes! Did you change it? Bought a two pound bag of Brussels sprouts at Costco for four dollars and change! Hi Mary, the recipe never called for Szechwan peppercorns because they are hard to find, and I try to keep my recipes accessible. You could experiment with them if you’d like. I know the Szechwan peppercorns are not in your recipe, but if you read your old comments quite a few people said they could not find them. That’s why I thought you maybe changed to pepper flakes. Made the brussel sprouts….they were to die for! My husband and I ate the whole two pounds! This is my go-to recipe every week. I have shared this with so many veg and non-veg friends and the ADORE it! I increase the vinegar (because I love it so much) add chili garlic sauce with the Sriracha instead of red pepper flakes at the end as I found it more well rounded heat. I have even used cauliflower rice instead of white rice. Thank you, thank you for this recipe! You’re welcome, Jillian! Your variation sounds wonderful. This recipe is beyond awesome. I have to force myself to stop eating it. Yes, I ate an entire pound of these brussels for dinner once. (Don’t judge me…) Brussels sprouts get way too bad of a rap in the culinary world, but this recipe should make them a believer! Sichuan peppercorns are not a real pepper- in fact they are NOT even in the pepper family at all. They are from a citrus tree. They have only become available here in the U.S. in the last few years. They were completely, 100% banned & barred from importing into the US by the FDA because of a fungus on the tree that they grow on. Look it up- it’s very fascinating. They’re not really hot either, they may seem it for the 1st 30 seconds or so, but then it rolls over to a piney taste. You really have to try them. They are “Mala” which is ‘numbing yet spicy’ (translation is very -not exact). If you are as interested as I am in all things Asian- U should DEF find TheMalaProject.com to get the real story on most things Sichuan. Wow just found out the site now has a “Mala Market” for real authentic Sichuan pantry ingredients. Loving your site Kate and have put u in my favs, so I’ll definitely be back often to try out the other recipes -and will tell friends as well. Thanx so very, much much for the brussel sprout recipe- MMmm! This was a great recipe. I added steamed broccoli and string beans to the roasted brussels sprouts for some more substance. For the sauce, I substituted balsamic vinegar for rice vinegar because that’s all I had. I used maple syrup but I think honey or brown/cane sugar would’ve worked better. Also added some minced ginger to the sauce for a kick. Finally, added raw/thinly sliced red onion at the end which added another kick and some crunch. I was lucky to have Szechuan peppercorns around so I added that at the end and it 1000% enhanced the dish. Would highly recommend. Your version sounds delicious, Husko. Thanks! How do you think this would work with Worcestershire sauce as a substitute for the soy sauce? I am allergic to soy. Hi April – Great question! You could try that or coconut aminos are a great sustitute when you are looking for similar flavor but cannot do soy. I hope this helps! I love, love, love this recipe! My partner and I are brussels sprouts freaks and are often looking for the perfect recipe for them, which isn’t easy! This is it. We leave off the garnishes and it’s still delicious. I won’t make sprouts any other way! That’s great to hear. Thanks so much for your comment and review, Andrea! OMG! This is so delicious. Doubled the sauce and added some sautéed tofu, mixed it together with the roasted brussels sprouts, poured the sauce over all, sprinkled with peanuts and served over brown rice as our entree. Husband says it is the first time he’s ever enjoyed Brussells sprouts and asked that it go into our regular meal rotation. Crazy good! Now, he will be more likely to eat them from now on right?! That’s great to hear, Sue. Thanks so much for sharing and for providing a review. I have made this several times with Brussel sprouts & with broccoli. What I like to do to make it for dinner is double the yummy sauce & put it over soba noodles. BIG hit – thanks Kate! 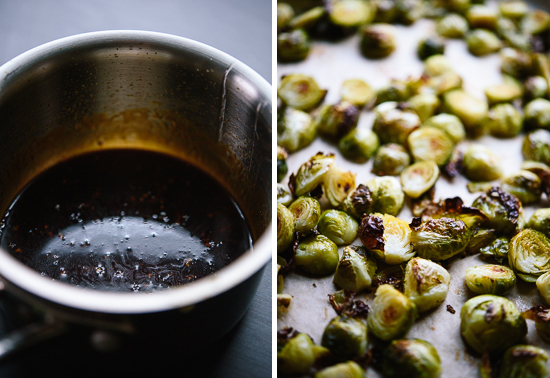 Hi Kate – I LOVE your website and I love this Brussels sprout recipe. Lately the brussels have ended up totally mushy. I think my WOLF oven runs hot. Should I be lowering the temp I’m roasting at or should I be shortening the time to avoid the over-cooked mushy sprouts? Thanks so much!! Ovens! They can be tricky. I would recommend checking on them more frequently, instead of turning the temp down as you aren’t sure how the temperature varies. To test the temperature, you can always insert a thermometer in the oven to see exactly what it is up to. Hope this helps! Thank you! Dinner was amazing thanks to your recipe. Oh, great, Sandy! I’m so glad you enjoyed them. Thanks for the review! This recipe is my favorite recipe on the blog (and that is REALLY saying something)! My husband has never liked Brussels sprouts, but he gobbled these down. I use this sauce on all kinds of roasted root veggies (sweet potatoes, broccoli, etc. ), or anytime I need a stir-fry sauce, and it’s my go-to recipe for convincing people that vegan food certainly doesn’t have to be bland. Thank you, Kate, for teaching me how easy and delicious it is to make my own sauce! Favorite on the blog! That’s wonderful. You’re very welcome! The combination sounds great. I know! So good. I’m glad you think so too. Wonderful, Janene! Thanks for your review. I loved this recipe! I made some brussel sprouts for two and then used the rest of the sauce on our salmon filets. It was a great dinner! I picked up some frozen sprouts on my last trip to Trader Joes — do I need to defrost them and cut them before making this, or can I roast them whole from frozen and just cut them on the plate as they are devoured? Where we are, fresh sprouts are hard to come by! Since you only have access to frozen, I would make sure they are thawed otherwise they will take a lot more time. Let me know what you think! Kate – the first time I tried the receipt everything was fine and delicious… but after that I’ve tried other 2 times and it did not work… after 5 minutes cooking I don’t get a homogeneous sauce, it seams that the oil is on top and the test of the ingredients at the bottom. Is there an email address that i can send pictures so you try to help me figure out what I might be doing wrong? Thank you! Hi Flávia, I’m sorry to hear of your troubles with this recipe! It sounds to me like you need to whisk it more while it’s cooking. Otherwise, I really don’t know why the ingredients won’t mix together! Made this with Brussels sprouts and baked tofu. Yummy!! Let me know what you think when you try it, Becca! This is a family favorite! Even my kids, 8, 5, and 3, all love it! That’s awesome! I love it’s loved by all ages. I didn’t have any of the ingredients for the garnishes on hand, and this recipe was still fantastic! My husband even brought up how good the brussel sprouts were the following morning thanks for the great recipe! Delicious!!! I made the same amount of sauce but for halt the Brussels sprouts (cause I love sauce). Turned out a little salty but delicious nonetheless. Sprouts were lovely and creamy, sauce sweet and salty with a little bit of a kick. I used to make Thai Brussels sprouts, in a pan, just with soy sauce, chili and some honey (I think), but cooking them in the oven is much easier and gives a better texture. Thanks for the great recipe! I just tried this recipe. They are awesome! My family loved them! I did not have peanuts, so I toasted sesame seeds and garnished with them. I’m happy to hear that, Walter! Thanks for sharing. This was absolutely delicious! My Daughter who always said that she hated Brussels sprouts said that she liked these. Thank you very much for the recipe. I’m glad you liked it, Maria! Thanks for sharing.